Katie, better known as "The Wild Child" ! She is the live-wire in the house, always looking for trouble, and usually FINDING it!! She is a "thief" without equal, racing off with socks, slippers, or any other item that can be easily "snagged on the run" ! She spent most of her puppyhood climbing onto the coffee table to pluck flowers from the arrangement there......and still gives the table an occasional "close inspection". She is a master at getting treats out of her Kong, usually in under 2 minutes. She loves doing things "her way", and has a definate "stubborn-streak". Her favorite toys are her many balls, of all shapes and sizes....large furry ones, soft squeaky ones, balls with bells inside.....but her most treasured possessions are the "homeless, orphan" tennis balls that she finds, and brings home from her walks. The "Wild Child" is a social butterfly, never meeting a stranger. She adores meeting people, and truly does NOT understand when someone passes her by without stopping to give her the adoration she KNOWS she deserves!! She loves chasing squirrels, birds, and bunnies.....has never caught them, but it's not for the lack of trying! Katie is very observant....she loves watching television, preferring the Animal Planet channel. 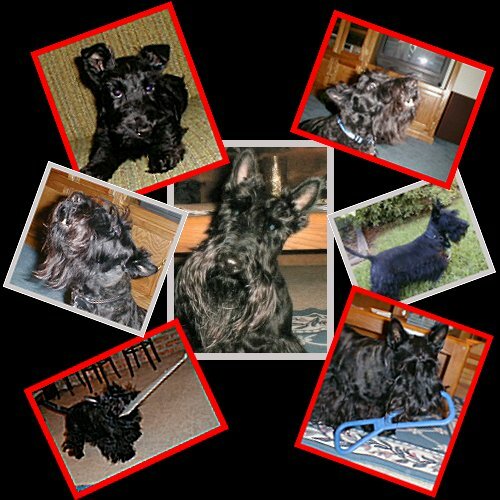 She is the first scottie I've had that has associated the SOUND of a plane with the visual SIGHTING of the source of the sound. She'll stop what she's doing in the yard, look up, and search the sky until she finds the jet overhead, then return to her "earthly" business ! Katie loves to lie on her back.....she naps on her back quite frequently, paws and tail completely relaxed, head thrown back or to the side.....napping the afternoon away. She loves playing with Riley, and often will flip over on her back to wrestle with him. They adore chasing each other through the house at full speed, making loud "growly" noises, kicking tennis balls everywhere as they run! Katie Wild Child is an adventure on four paws.....it's never dull, she's never bored...and if you look closely into those brown eyes, you can SEE her planning her next "caper" ! SADLY, my beloved Katie WC crossed the Rainbow Bridge on Saturday, June 18, 2011...after a long and valiant battle with lymphoma! The Warrior Princess' used her time wisely, living each day 'full throttle'! She's ONE special Scottie... there'll never be another like the Wild Child! Riley, my cuddlebunny and handsome hunk ! He loves cuddling in my lap with his head resting on the right armrest of the recliner.... and will issue 2, and ONLY 2 barks in my direction if the lap is occupied with a book, newspaper, or other item that prevents him from climbing up....waiting and WATCHING for me "clear his space" ! He stares you in the face and barks to let you know that you need to pay attention to him NOW! He loves to voice his opinions, loves to share his thoughts with anyone within earshot....and I think, just loves the SOUND of his own voice! He wears his feelings on his "paw", and is a sensitive guy, even though he sounds tough. Those who meet him are greeted by a very excited, affectionate guy....who plays and romps with them.....barking the entire time!!! He is most vocal about what he wants..... which is usually whatever toy Katie has in HER mouth!!! He has a wide greedy streak about toys.....he wants ALL of the toys, even Katie's yellow tennis balls for which he sees no USEFUL purpose !!! His self-appointed task during "ball playtime" is to block Katie from returning the ball to me. Katie retrieves the ball, and heads back to me with the ball in her mouth. Riley leaps into her path....Katie drops the ball, Riley grabs it and bounces off, only to drop the ball when Katie doesn't chase him for it. As he returns to me, empth-mouthed, Katie races over to the stolen ball, grabs it, and finishes returning it to me. Riley is sitting beside me, watching this.....waiting patiently. As the ball is thrown again, Katie races after it, and again returns with the ball.......to find Riley again in her path.....again, and again!!! That's OUR way of playing ball !! Riley's vocalizations are best experienced with the television. He ADORES singing along with the tunes that strike his fancy during commercials, movie musicals, or any musical entertainment. He begins with a whine, perhaps to warm up his vocal chords. Then, as he listens to the music, he throws his head back, raises his furry muzzle into the air, and sings his little heart out! Not all tunes, only those that he feels need his harmony. An amazing performance, truly! Sir Riley adores burying his head into the very bottom of their toybox, searching for that one, perfect toy. He tosses rejected toys aside, as he digs ever-deeper in search of HIS toy.....a long, rubber "pully". He grabs his treasure in his mouth, and swings it wildly as he brings it over to me to tug against him. When ignored, he'll toss the "pully" across the floor.....repeatedly, until he is played with! Persistence is his middle name!! He adores playing with toilet tissue rolls, paper towel rolls, and the ultimate "giant, mutant" wrapping paper roll !!! Rileyman knows exactly how to push Katie's "buttons" to begin a frapping session, a wrestling match, or some other wild, exciting chasing game. They adore playing together, they are inseparable, and definately have a mind of their own. 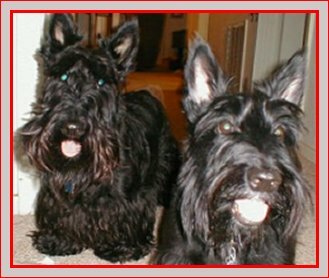 Their playtime is never quiet, is always amazing to watch, and is best watched from the sidelines.....so as not to be overrun by racing scotties!!!! 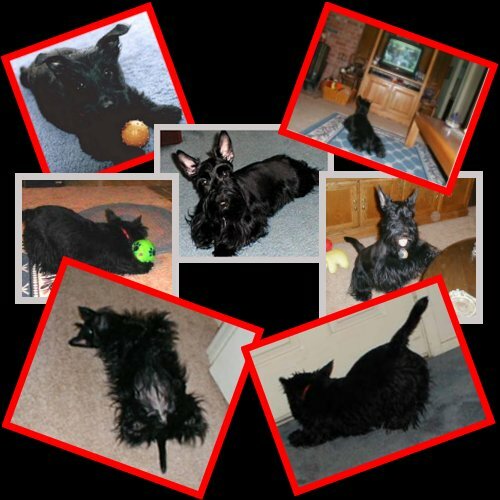 Riley is a sweetheart, a true scotsman, and my loving shadow....26 pounds of adored scottie! Katie and Riley......the Wild Child Gang. day to the fullest, and as a huge adventure. I adore this Wild Child Adventure I'm living!!! �Copyright 1999-2014 All rights reserved.